Police in the Brazilian city of Rio de Janeiro have arrested a local lawmaker on suspicion of heading a paramilitary group linked to a series of murders. 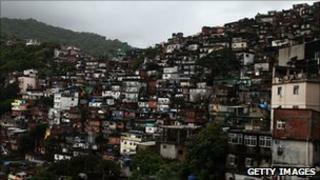 They say Luiz Ferreira da Silva runs an illegal armed group which controls 13 Rio neighbourhoods, a charge he denies. Police said the group had been planning an attack on the city's police chief. Originally formed to offer protection from drug gangs, many paramilitary groups are now running the criminal rackets they once fought. Luiz Andre Ferreira da Silva was arrested at his home in Rio. Police said they had been investigating the paramilitary group he is alleged to have run for two years. The officers said they had brought the operation which led to Mr Ferreira da Silva's arrest forward after uncovering a plan to kill Rio police chief Martha Rocha and lawmaker Marcelo Freixo. Mr Freixo led an investigative commission which uncovered the growing influence of paramilitary groups in Rio.